Our biggest project was the reshaping of the Norwood Triangle. It used to be sea of tarmac, now it's planted up with trees (see above), box and lavender. With its art work commemorating the area's industrial past, the new seat and the information panel, it's now a delightful focus for our area. We maintain the triangle, watering the planting, mulching, litter picking and trimming the box. ​We've also tidied up a couple of smaller sites: the Andover Triangle and the Ashford Road Rectangle​. ​Some of these stories are told below and on other web pages. We will be looking after these local trees and green spaces, and are ready to do more work of this kind if needed. .......and (below) both amelanchiers are planted - now wait for spring! 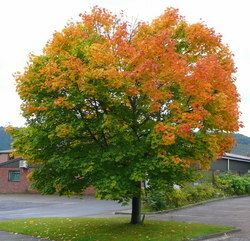 ​Glos Highways have replaced the horse chestnut we lost last from disease year in Grafton Road. They've planted a young oriental plane. ​CBC Tree officer, Chris Chavasse, recently walked 'our' trees with committee members John Paterson and Adrian Phillips. We agreed a watering and mulching programme for a number of them. We've also agreed with the owner of 177 Bath Road some planting in his front garden - part of the expanding scheme of amelanchier lamarckii trees and shrubs that add colour and greenery to our shopping area. Partly funded by SPJARA, they were planted on 20 February 2017 - see photos below. For the techy, the Norway Maple is acer platanoides, a species native to a broad swathe of territory from France to Russia, and from Scandinavia to Iran. It's growing well, but we have added a cage to protect it. ​We've cleared up the little triangle where Andover Walk meets Andover Road. It was an eyesore with litter and tough weeds like nettles. ​In November 2015 a small gang descended on this neglected area. We removed the litter, cut down the brambles, dug the area over and added compost to the soil. Then we planted shrubs and over a hundred bulbs. ​The bulbs first came out in March 2016 and looked great! In June and in August we did further weeding. 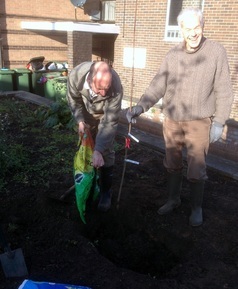 Thanks to Hugh Curran for organising the weeding party and applying some mulch to suppress weeds in future. ​Then in September 2016, we planted more plants generously given to us by SPJARA members. Thanks to Jonathan Moffitt for his efforts to co-ordinate this. The results were to be seen in March 2017 as the bulbs came out again (see below). September 2016: Further planting with cotoneaster, sedum and more. And now the Ashford Road "rectangle" is looking great too! 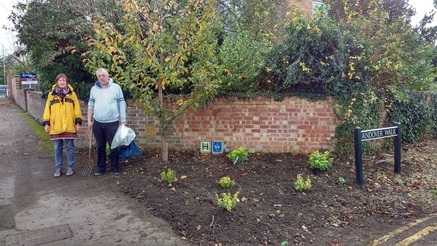 ​Hugh Curran and his friends have done a great job tidying up the neglected area beside the lane off Ashford Road. They've cleared the weeds and litter, planted it up with bushes and small plants, and covered the soil with mulch. There's also a sign to say "It's SPJARA wot dunnit!" see below (and a similar one on the Andover Triangle).